This year's speakers included Alex Russell, Miri Rubin, Jonathan Morton, Ryan Perry, Julia Boffey, and Christiania Whitehead. Download the programme here. 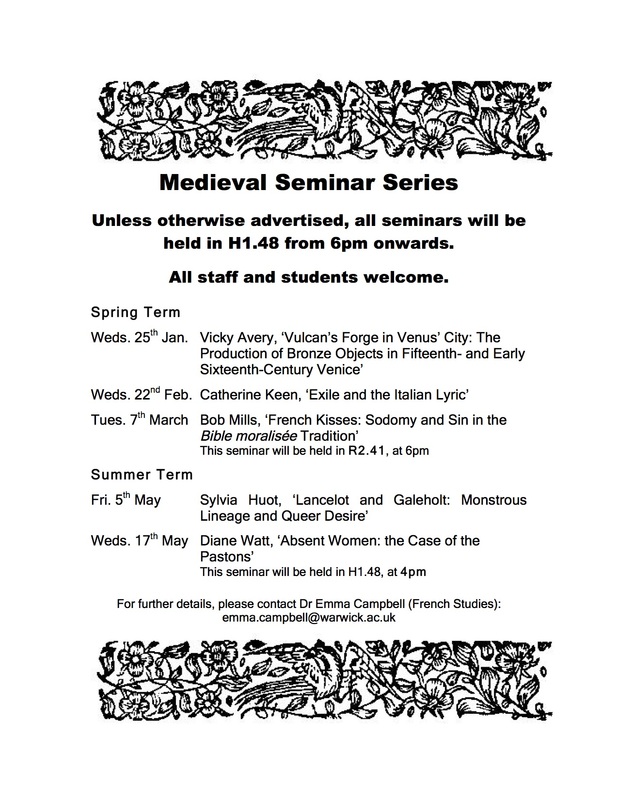 Medieval Women's Writing: Workshop. After the success of last year's event, we again ran an afternoon workshop at the University of Warwick, Wednesday 24th January, which looked at a selection of 'canonical' texts by women writers from England and beyond. 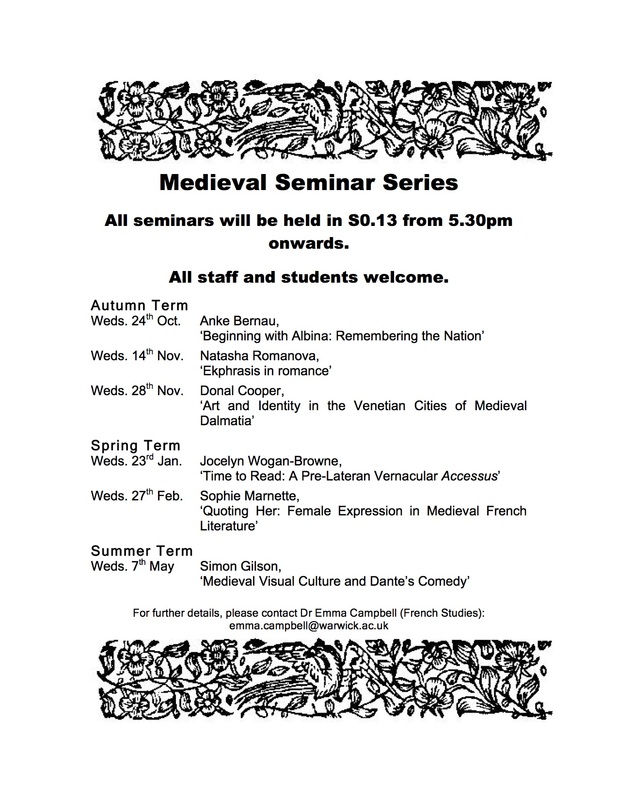 We read a range of short extracts, as well as looking at other artistic and musical pieces created by medieval women. We integrated the workshop into a larger series of events highlighting the work of women writers as well as feminist and gender theories across a range of historical periods. The material we discussed can be downloaded here, and a longer write up of the event found on the Warwick SMLC blog. 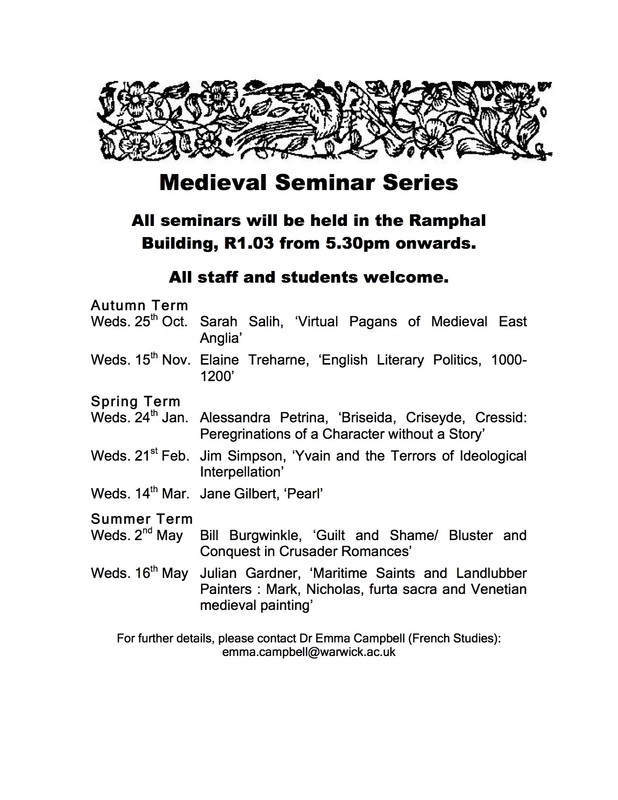 Medieval Women's Writing: Workshop. This afternoon workshop at the University of Warwick, Wednesday 22nd February, looked at a selection of 'canonical' texts by women writers from England and beyond. 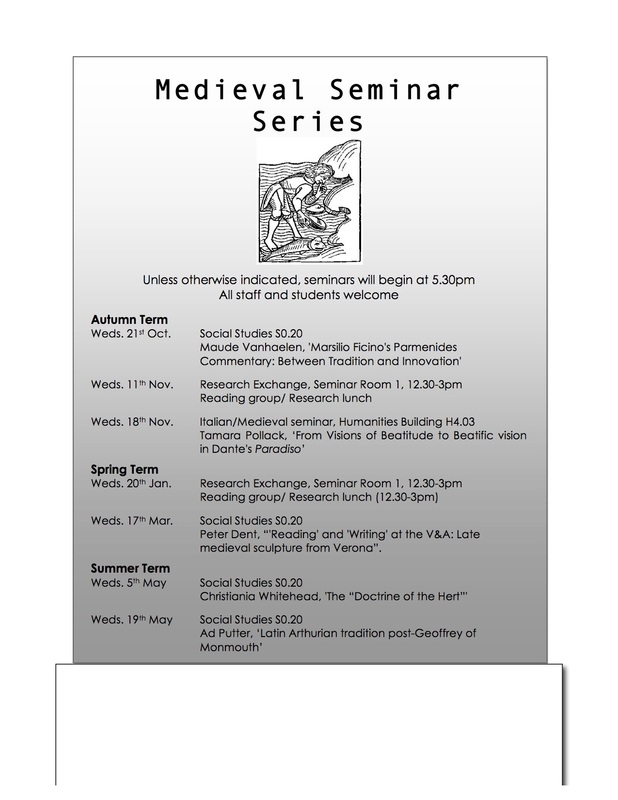 The workshop was particularly aimed at students taking medieval undergraduate modules, and we read a range of short extracts which can be downloaded here: Medieval Women's Writing Workshop Reading Pack. There was a great turn out and some wonderful lively discussion. Many thanks to all participants. 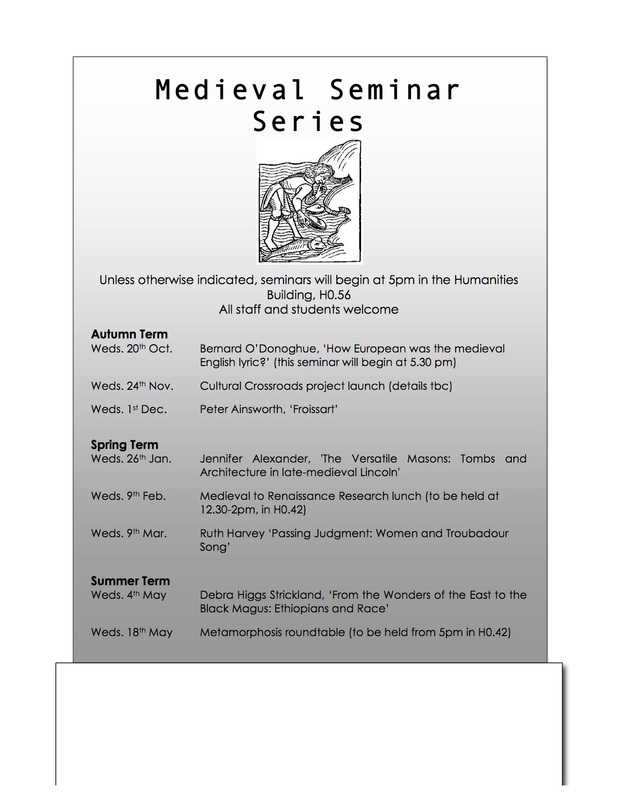 Bodies in Flux: Rewriting the Body in Medieval Literature, Art and Culture 1000-1450. 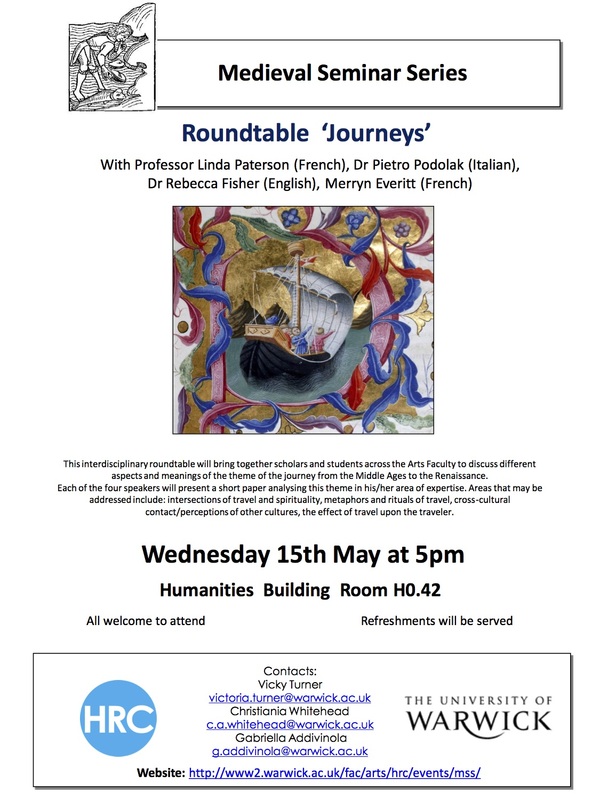 This interdisciplinary conference was held on Saturday May 20, 2017 in the Wolfson Research Exchange in the University of Warwick Library, with the kind support of the Humanities Research Centre and the Society for French Studies. The keynote speakers were Miranda Griffin (Cambridge), Robert Mills (UCL) and Debra Strickland (Glasgow).The conference asked what the transformation of the body means for the conception of bodies of different kinds: human, nonhuman, animal, material, divine, and how the representation of these changes in different media reflects on and inflects the boundaries conventionally associated with the body. More information, including the day's programe, poster, and call for papers, can be found on the webpage. This year's speakers included Elizabeth Eva Leach, Kathleen Neal, Tom Hinton, Linda Paterson, Anthony Bale, Marion Turner, and David Wallace. The programme can be accessed here . 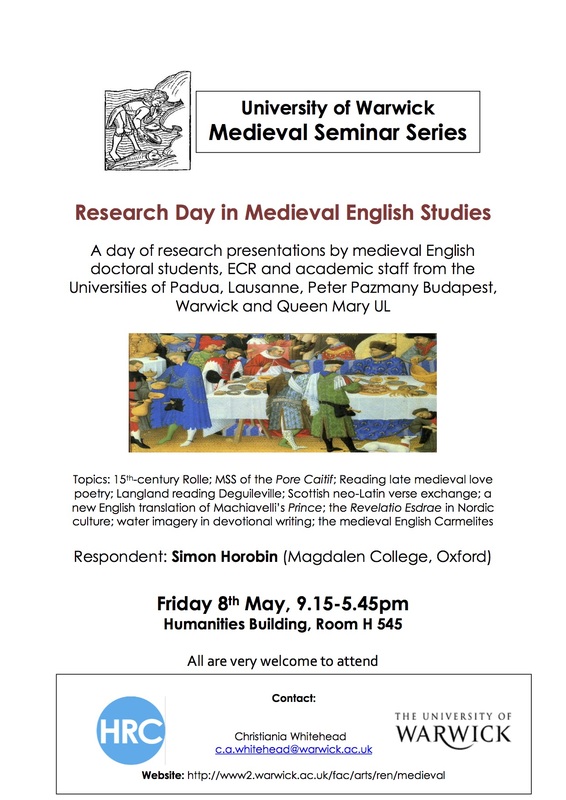 Workshop: Cannibalism and the Eucharist: this afternoon workshop at the University of Warwick, Wednesday 15th June 2016, in the Wolfson Reaearch Exchange, examined the uses of cannibalism and the Eucharist across a range of secular and religious texts in a variety of languages. For more information, and to access the reading material, visit the webpage. 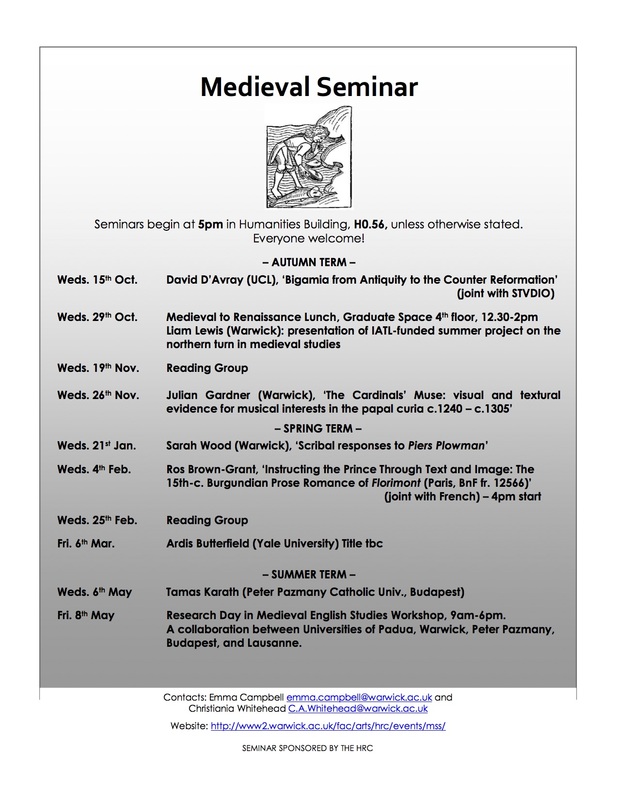 Medieval Material Matters: This one-day interdisciplinary research day, on Monday July 18, 2016, aimed to cultivate research links between medievalist postgraduate communities from different universities across the UK. Professor Catherine Brown gave a plenary lecture on 'Manuscript is the New Digital'. 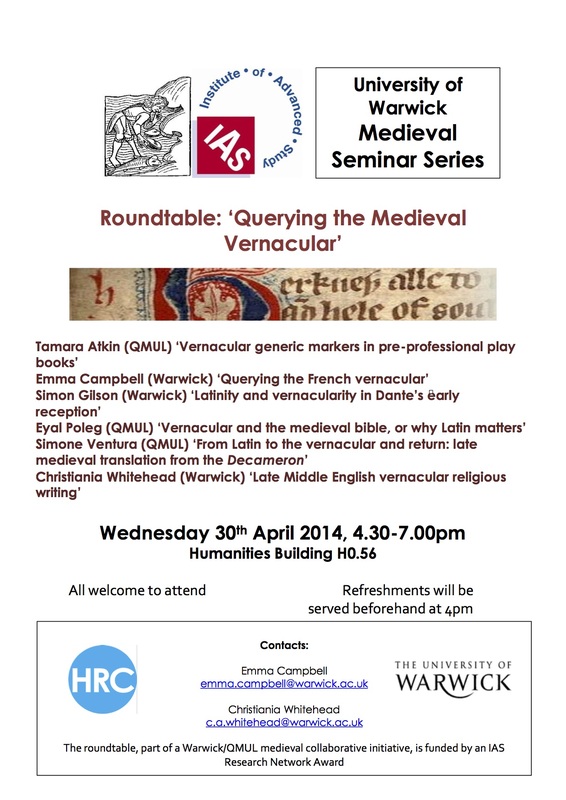 The Conference was funded by the HRC at Warwick. For more information, visit www.medmaterialmatters.wix.com/warwick. 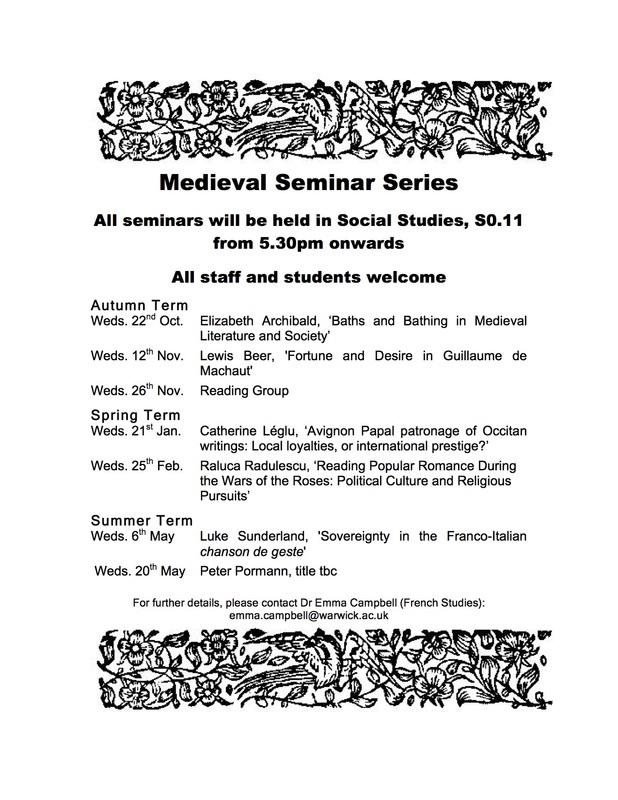 Troubadours, Trouvères and the Crusades: Professor Linda Paterson is principal investigator of the 4 year, AHRC-funded Anglo-Italian Crusade project. Two books emanating from the project will be published by Boydell in 2017-18: Singing the Crusades, by Linda Paterson, with the help of collaborators (Luca Barbieri, Ruth Harvey, Anna Radaelli, and others) and Crusades and Poets, ed. by Simon Parsons and Linda Paterson. For more information, see the project web site. Speakers included Adrian Armstrong, Marilynn Desmond, Merryn Everitt, Simon Gilson, Daniel McCann, Giorgio Tagliaferro, Thorlac Turville-Petre and Juan Miguel Valero Moreno. 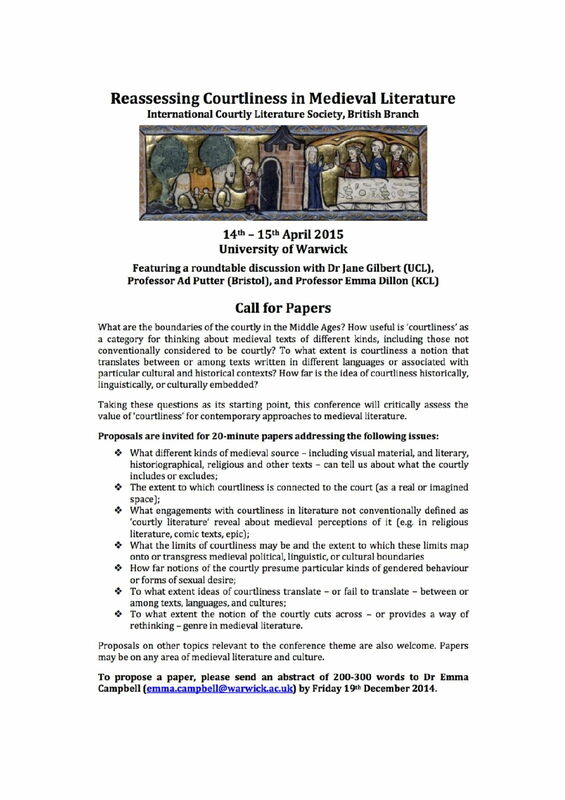 International Courtly Literature Society (British Branch): Reassessing Courtliness in Medieval Literature (cfp poster). 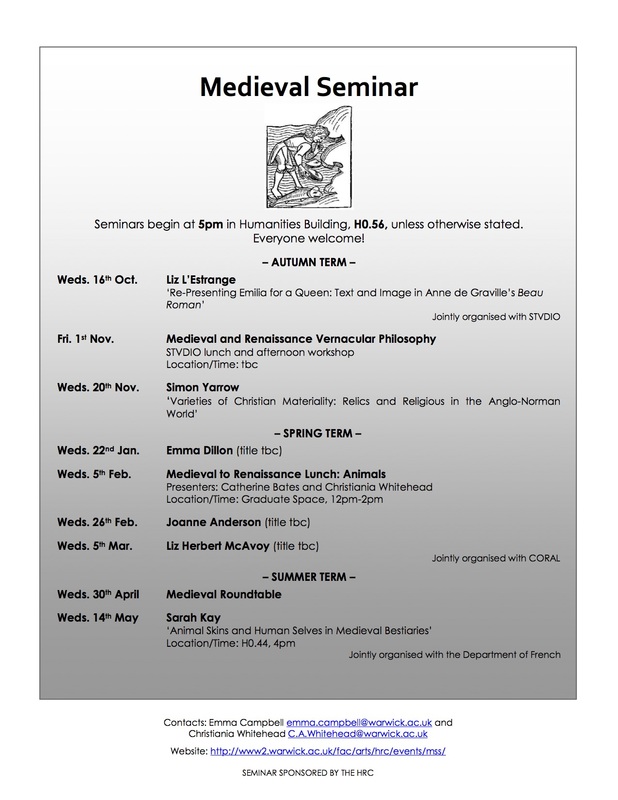 Emma Campbell organised the International Courtly Literature Society (British Branch) conference, Reassessing Courtliness in Medieval Literature, on 14-15th April 2015 at the University of Warwick (cfp poster). The conference featured a roundtable discussion with Dr Jane Gilbert (UCL), Professor Ad Putter (Bristol), and Professor Emma Dillon (KCL). 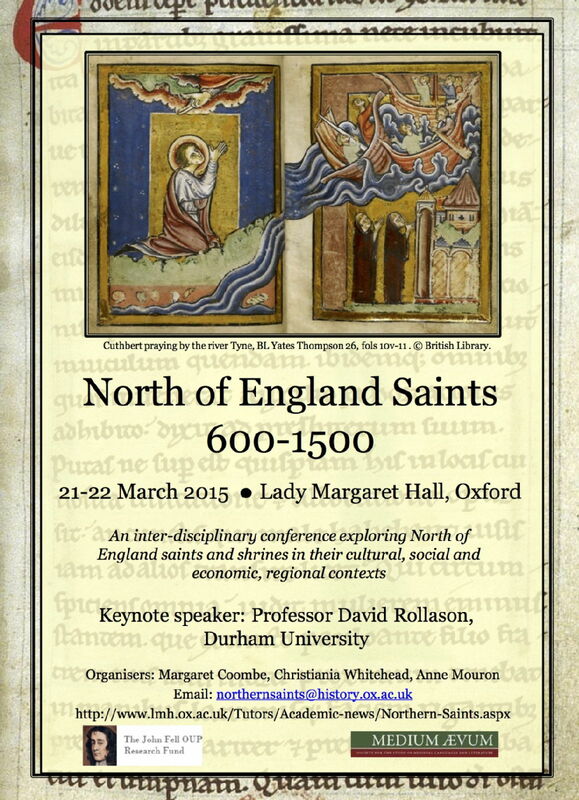 North of England Saints Conference: Christiania Whitehead co-organised North of England Saints, 600-1500, 21-22nd March 2015, at Lady Margaret Hall, Oxford. 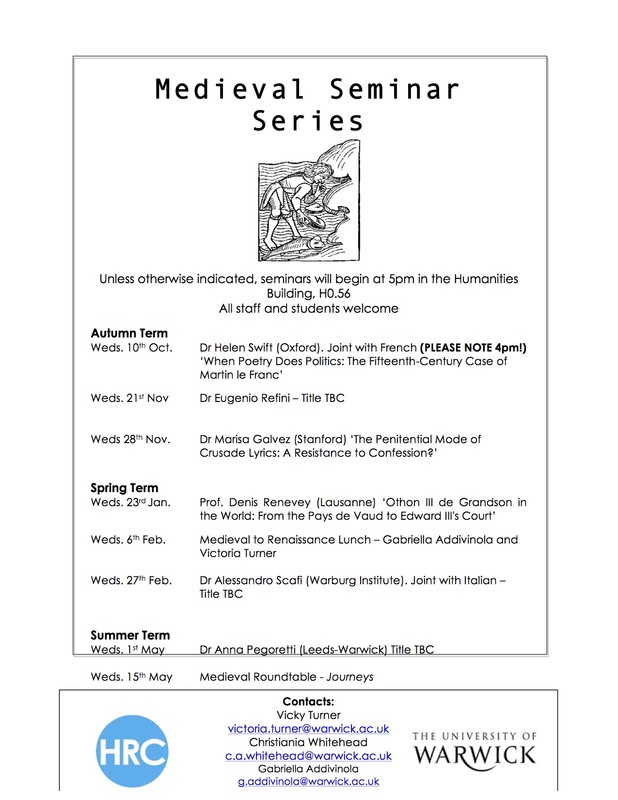 This two-day interdisciplinary conference examined the lives and cults of medieval saints from Northumbria, Yorkshire, Westmoreland, Cumbria, and southern Scotland, from cultural, economic, social and political perspectives. (poster). Medieval Concert: Medieval ensemble Stella Maris came to Warwick on the 2nd March 2011 to perform a selection of medieval music and to answer questions on music and performance.